Al Maha Ceramics, a leading tile brand in the GCC, launched its latest range of new décor tiles at the recent Big (Builders International Gathering) Show 2015, a major event for professionals in the building and construction industry, in Muscat, Oman. Al Maha Ceramics showcased its extensive range of wall and floor tile designs to local and international visitors at the exhibition held at the Oman International Exhibition Centre. This is the sixth year that Al Maha Ceramics has participated in this exhibition. “We feel it is the right time for us to continue with our marketing initiatives and we have aggressive plans in place to expand our brand across the GCC. “We are expanding our production capacity which will enable us to increase our production by 120 per cent in future and meet the increased demand of our high quality tiles. The first phase of this expansion is on target to be completed by 2016 and will take our total capacity to approximately 10 million sq m per annum,” he added. Al Maha Ceramics showcased its new attractive designs of ceramic tiles to the visitors from different sectors of the industry from over 15 countries. 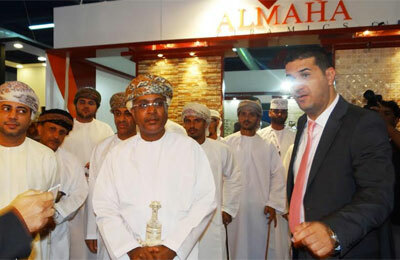 Around 13,000 decision makers from a large cross section of trade industries visited the exhibition.